Primark annex next to Mothercare occupies Victoria Chambers, a fine building from the 1890s in the Arts & Crafts style with its characteristic Dutch influence. With the building of a new section of road called the ‘New Cut’ in 1832, a sharp bend in the High Street was removed. The buildings constructed following this work included No. 47 which became the china, glass and pottery emporium of Joseph Wells. Here on 21 September 1866 Herbert George Wells was born. He spent much of his early childhood in the town until he was apprenticed to a draper and left the area. Please see more about HG Wells on our page here. No. 47 became part of Medhursts in 1879 when Fred Medhurst bought several adjacent properties. 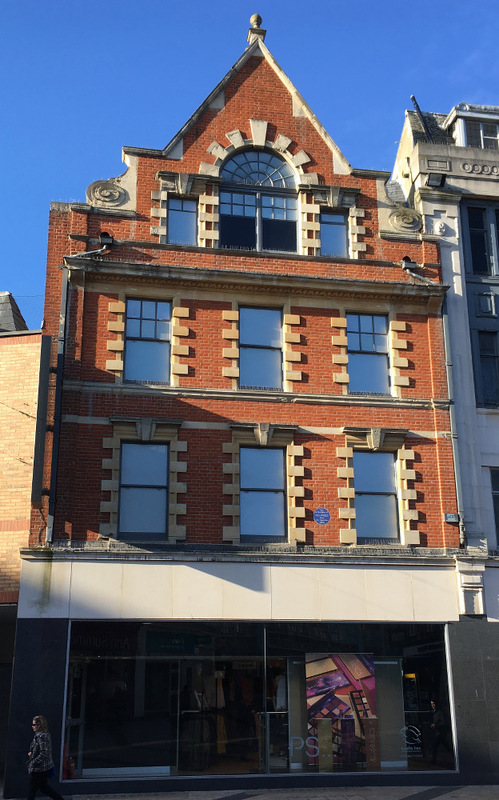 The Primark store still has the name Medhurst on the building which stands today, and a plaque to commemorate the birthplace of H G Wells is displayed on the front of the shop. This entry was posted in Uncategorized and tagged Arts And Crafts, Heritage Buildings, HG Wells, High Street, LBB-Bromley-North-Trail, Market Square. Bookmark the permalink.